Zebra's SimulScan is a set of productivity tools that can optimize the efficiency of data-capture workflow by enabling workers to acquire multiple points of data in a single step. When integrated with SimulScan APIs, captured data can be parsed directly into an organization's native Android applications. Forms have one or more barcodes of the same of differing symbologies. Such scenarios are well-suited to SimulScan Multi-barcode mode. Note: SimulScan features also can be explored using the SimulScan Demo App, which exposes all features and functions except the ability to save acquired data. The Demo App is included on all supported devices. Most acquisition tasks involve capturing data from printed documents. These "target" documents often vary in size, shape and layout, and present a challenge for accurate data acquisition. Templates solve this problem by "teaching" SimulScan about the documents it will encounter, and defining how to scan and process data for each instance of that target document. Document Capture mode captures a snapshot of the document and extracts 1D/2D barcode data, alpha/numeric characters and images, and can detect the presence of check marks and signatures as defined in the document's Template. 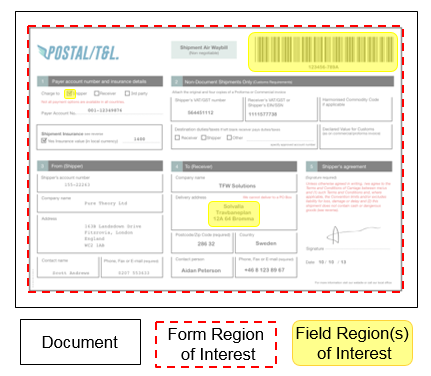 These so-called "Structured" Templates define "Form Regions* of interest" on Documents to be scanned, "Field Regions of interest" within those forms, the types of data (barcode, text, etc.) to be extracted, and how it will be processed. Scan targets must be of a fixed layout and a Template must be created for each target encountered by the organization. A sample document on which Document Capture would be employed. Multi-barcode mode is designed to capture one or more 1D/2D barcodes of the same or differing symbologies from a single scan target. The target layout can be fixed or varied from one scan to another, and the Templates when used here are referred to as "Unstructured." Templates are optional for Multi-barcode mode, and are generally required only when it's necessary to specifically include certain barcodes and ignore others. This mode also supports barcode prefixes, which can be parsed to provide processing information for the data being acquired from each barcode. 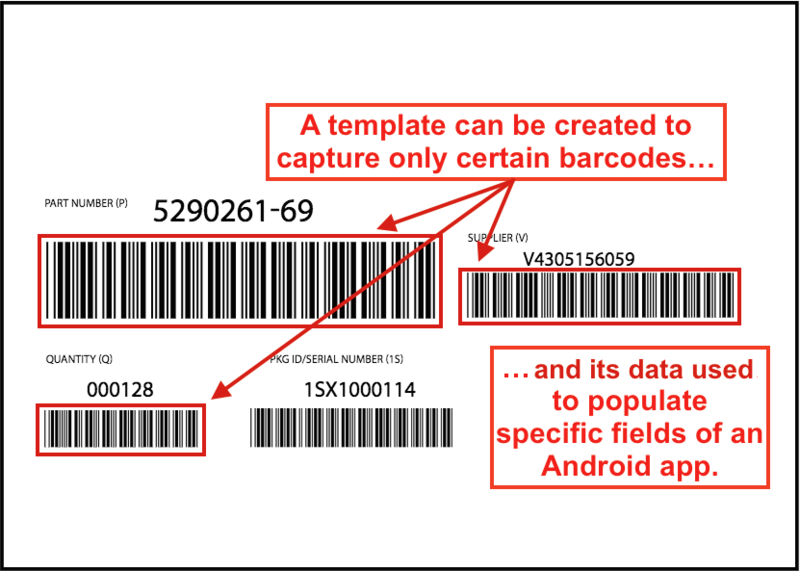 A Multi-barcode mode Template can specify barcodes to include and which to ignore. SimulScan is free for many scanning scenarios, including when used with DataWedge and its default Templates or from a custom app to scan only barcodes and/or for certain types of OCR acquisition. A per-device license is required for advanced SimulScan features. For licensing details, please see the Licensing guide. SimulScan features also can be explored using the SimulScan Demo App, which exposes all features and functions except the ability to save acquired data. The Demo App also can be used to test custom Templates. See the SimulScan Glossary for a complete list of terms. SimulScan works with all device cameras, and on devices with a supported 2D imager; 1D imagers are not supported. To identify the imager installed on a device, see About Device > Hardware Configuration in the device Settings panel.